Is not voting something like committing voter fraud? That question may sound silly, but since we are deep into the “silly season” of this election it is one worth asking. Is not voting something like voter fraud? Think about the following scenario for a moment, and you might begin to think the answer is “yes”. In recent months you may have come across a staunch supporter of Candidate A in a hotly contested race who says something like “if you don’t vote for my favorite Candidate A it’s the same as voting for that horrible Candidate B.” Then sometime later, a supporter of Candidate B tells you the exact same thing, just in reverse. They say not supporting Candidate B is the same as voting for that horrible Candidate A. Taking that thinking to its logical conclusion, not voting at all is like voting for both of the candidates. If that were literally true, voting twice by not voting at all would be committing voter fraud. Fortunately, staying home or leaving individual races blank on your ballot is still a valid option that doesn’t involve committing a felony. However, it also doesn’t mean what many voters think it might. Notably, it doesn’t mean you are casting a “protest” vote. You aren’t effectively protesting anything because one of the candidates is still going to win. Also, our electoral system does not allow you to truly vote against a candidate, so please don’t go around saying “I voted against Candidate A by voting for Candidate B”. No, you didn’t. You voted for Candidate B and for all the consequences that entails. If somewhere down the line Candidate B does something predictable based on their political philosophy and you think that something is horrible, remember, you voted for that too. In this election season saying it’s meaningless to sit out a race because you don’t like either candidate may sound harsh. It is also true. Not voting at all in a race when a candidate is unopposed might make a voter feel better, but it doesn’t change the outcome. One would hope it might send a message, but it’s hard to say even a large undervote or “protest vote” in these cases makes much of a difference. Take as examples, the Mayoral races last cycle in Cornelius and Davidson. Both Chuck Travis and John Woods were unopposed. Both received a large percentage of write-ins or undervotes against them due to their stance on the I77 toll issue. Both of them still went to Raleigh to advocate for the project to Senate leader Phil Berger after that “protest”. A protest vote only matters if those it’s cast against care. In a race with two or more candidates, not voting is very unlikely to impact the outcome and you can be sure whichever candidate gets the most votes won’t care about how many people left the race blank. It goes to the fundamental nature of the two party system. State and Federal general elections are head to head contests employing the “first past the post” method to determine the winner - meaning whoever gets the most votes wins. Period. Yes, there is the Electoral College in the Presidential election, but since NC might be a critical state whichever candidate gets the most here could determine the overall outcome. None of this is to say voters should always hold their noses and pick someone. If you think both candidates in a race would likely vote the same way on the issues most important to you and you oppose their position, leave it blank. Just know someone will win and they will be representing you on that issue and others as well. The way to remedy this situation over time is to have better candidates up and down the ballot. The best way to have that happen is getting more people involved in the political process working to have the best people bubble to the top. After this election where so many people are talking about not voting due to dissatisfaction with their choices, where we go afterward as the voting public may be as important as who wins on election day. 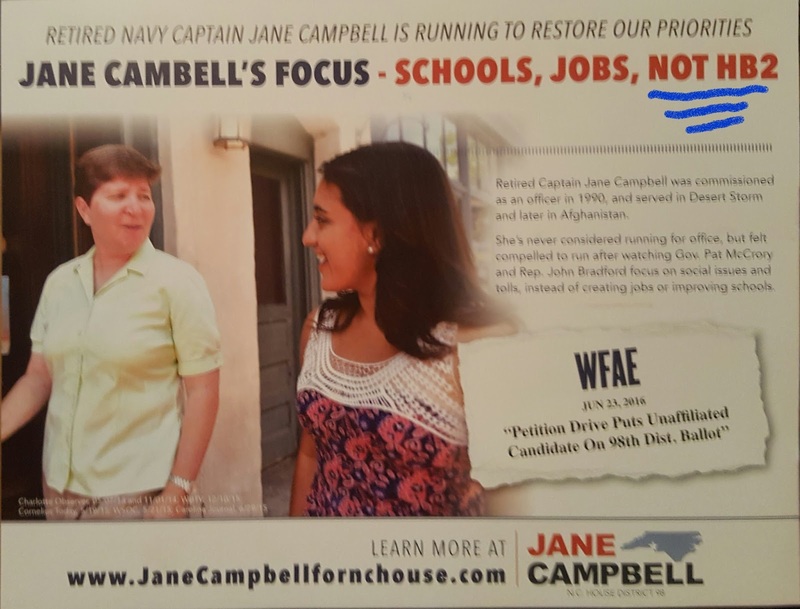 Jane Campbell's latest flyer denies impact of social issues on her campaign. 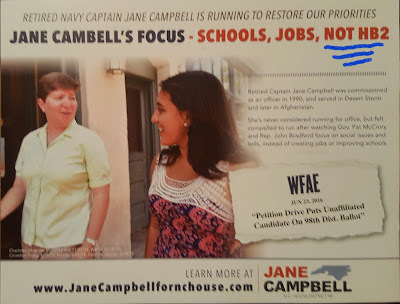 aShortChronicle has covered the blizzard of campaign flyers funded by dark money blasting Rep John Bradford in support of Jane Campbell's quest to unseat the NC98 incumbent. 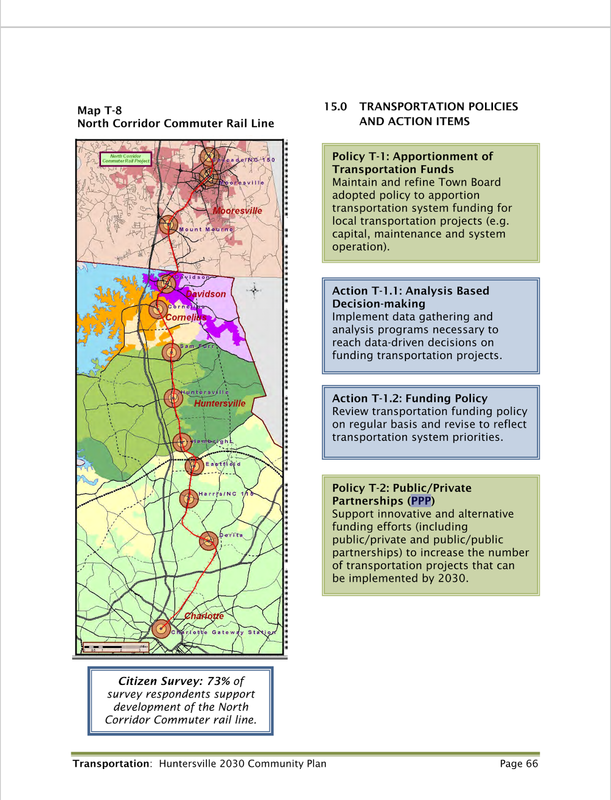 Those flyers have been mostly about the I77 HOT lanes issue. The interesting and contradictory point about those flyers was that Campbell's stated reason for getting in the race was the controversy around HB2 - not I77. Now comes a flyer from the NC Democrats stating Campbell's priority isn't even HB2!!! This of course does not mesh with media reports or Campbell's own campaign website. “HB2 was really the tipping point for me,” said Jane Campbell. There's also this one on her site and this podcast as well which focus primarily on HB2 being the reason for her entering the race. This most recent flyer also bashed Rep Bradford over "social issues" more generally. Yet, Campbell's campaign has been endorsed by multiple social issue advocacy groups that would be described as anything but moderate. The Human Rights Campaign (HRC) is the country's leading LGBT advocacy group. HRC advocacy was behind passing the City of Charlotte ordinance which spawned the whole HB2 controversy. The HRC endorsed Cambell in September. Lillian's List has also endorsed Campbell. The group is the state version of Emily's List. 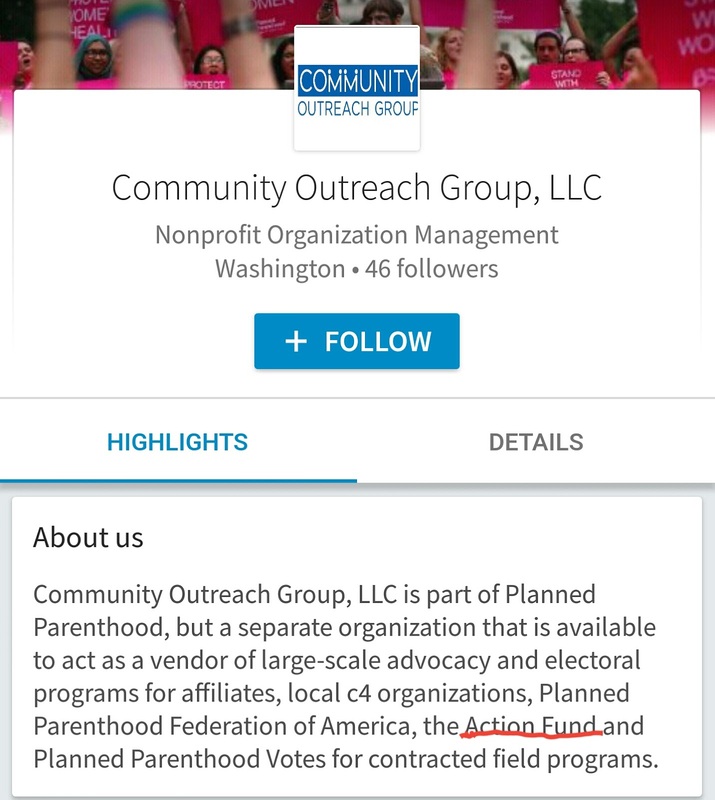 It is the leading pro abortion rights advocacy group in the state. aShortChronicle told readers about Lilian's list two years ago when the group endorsed Bradford's former opponent, Democrat Natasha Marcus. Lillian's List has Campbell listed as one of their featured candidates this election cycle. In the linked podcast, Campbell admits that if she had filed during the open filing period, she would have run as a Democrat. Instead, she is on the ballot as an Unaffiliated candidate. Misleading flyers both against her opponent and in support of her campaign should not dissuade voters from knowing who they are voting for in this election. Campbell is running on as the effective replacement Democrat on a standard Democrat social issues platform this campaign season. As aShortChronical has reported on extensively, Rep John Bradford has been the target of a blizzard of flyers paid for by NC Families First - a shadowy outfit funded by big DC money. 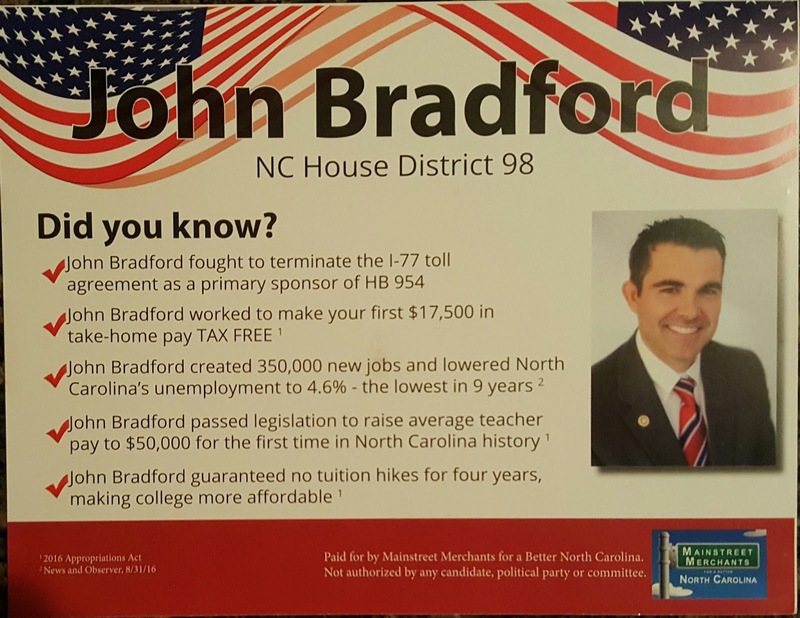 Well, it now appears Bradford is finally getting a little outside help as well in the flyer battle for NC98. In recent days aShortChronicle HQ has received a few flyers from two organizations - "Mainstreet Merchants for a Better North Carolina" and the "NC Realtors"
The Mainstreet flyers hit mailboxes first with the NC Realtor drops occurring at the end of last week. Here are a few things to notice about these flyers versus the ones from NC Families First. These ads are all "support" ads for Bradford, not attack ads hitting his opponent. In fact, Mainstreet has a history of only running support ads. 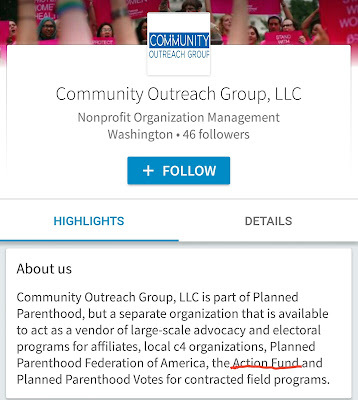 The money spent by these organizations appears to be significantly smaller than that of NC Families First. The money spent looks like it goes NC firms, not those in DC. Outside money is an unfortunate fact of life in politics these days. Now, some of it is flowing both ways in the final days of the race for NC98. "If you are having the worst day of your life, by the time you hang up the phone we want you to hear sirens coming." 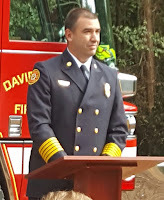 Chief Fitzgerald spoke those words Friday morning at the ceremonial ground breaking for the long awaited Davidson Fire Station #2 on Davidson-Concord Road. With construction starting early November the new single company station is scheduled to be operational by Summer of 2017. 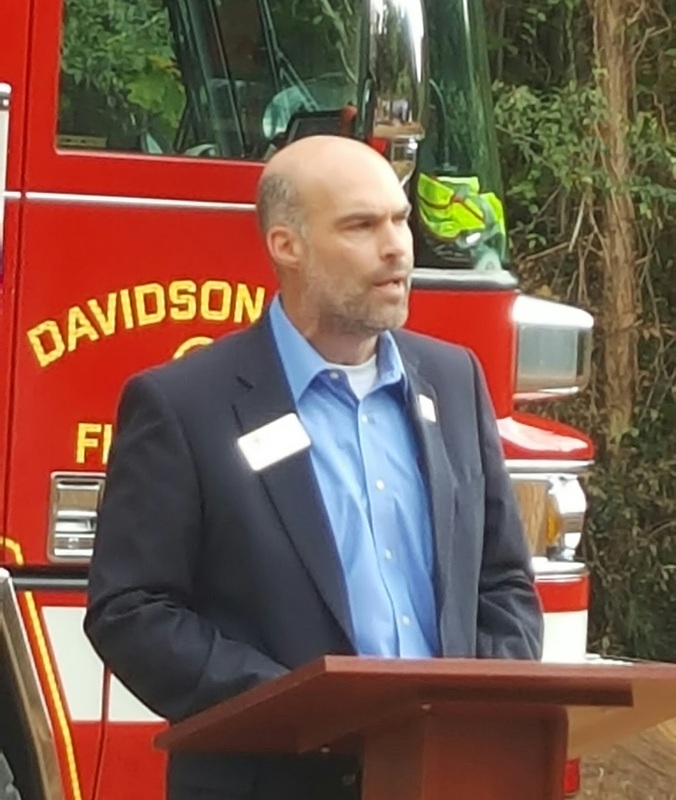 According to the Chief, currently some Davidson residents are as much as 15 minutes from the Downtown station, and this new station will cut that response time by an actual Davidson fire company by more than half. 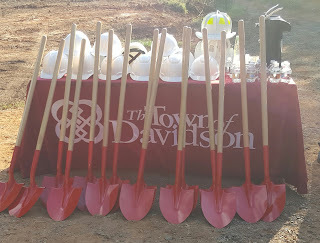 To accommodate for the current long response time, for several years Davidson has been contracting with the Odell station in Cabarrus County to cover the eastern end of town. Completion of Davidson Fire Station #2 will allow that relationship to change to one of mutual support, rather than the town having to contract out the primary protection responsibility. During his comments opening the ceremony, Mayor John Woods commented how this project has been a long time coming. Waxing nostalgic, he recounted one story of how the siren at the Downtown station used to be tested every day at 5:30pm, telling kids it was time do head home for dinner. He also took the opportunity to introduce some special guests including County Commissioner Pat Cotham and NC98 candidate Jane Campbell both of whom are running for office this election cycle. Town Manager Jamie Justice also said a few words, thanking staff for all their hard work bringing this day to fruition. While the project started before his tenure, getting this done as Justice nears his 1 year anniversary as Town Manager is certainly a nice accomplishment. The roughly $2.126 million project will be financed partly via a 15 year installment loan up to $2 million to cover construction. The town will cover equipment and furnishings separately. It's the largest municipal facility built since Town Hall was constructed 20 years ago and actually takes the top spot in terms of cost. More pictures from today's ceremony. Getting ready for the toss! Experienced pols Mayor Woods and County Comm Cotham win for "Best Camera Pose Mid Shovel"
the hard work of protecting the town. #Catalyst2: Davidson Hotel...Traffic Impact Analysis to be completed. Parking to be a major question. When the proposal for the new 6 story Hyatt Place hotel and restaurant along Davidson's Griffith Street was submitted back in August, maybe the most glaring omission for the project was the lack of a Transportation Impact Analysis, or TIA. The application submitted by local zoning attorney, Susan Irvin, said one was not completed because the property was going to be less than 75,000 square feet and per the town ordinance one was not required. Then, just before the public information session held October 3rd, the Town released its preliminary analysis of the project. The hotel will be a tad smaller than originally expected based on the number of rooms coming in at 107 rather than 115. However, the document also contained reference that a TIA would be completed because the hotel would total 85,000 square feet. aShortChronicle reached out to Ms Irvin to see what had changed and why the increase in size after the application was submitted. Below is Irvin's response. "My understanding is that the upper floor plans have not been completely designed even now, but the hotel architect started out with a template for the ground floor. Once they had comments from staff and flagship, they drilled down on the details – coffee shop space on the first floor, room layouts for 107 +/-rooms, flagship requirements, rooftop restaurant, etc. - that produced a more specific number and the local architect was able to start working on the design of the exterior based on that information. The original square footage was an estimate from the hotel architect based on the original first floor hotel template." aShortChronicle is told by town staff there won't be more scheduled public meetings on the project, such as the required combined Planning Board/Town Board meeting or the public hearing, until this study is done. That could take several weeks. However, there is one immediate impact to the discussion. Parking. We'd previously told readers about the potential parking issues with the site. In the project proposal the developer plans to only provide 70 off street spaces on its own site. The plan also includes 19 on-street spaces and 29 "shared" spaces with Woodies next door. Both of these pieces of the parking plan are allowed by town ordinance. The town ordinance requires 2 parking spaces per 1000 square feet of commercial space. That small amount was called out in the earlier article when the estimate for the hotel was smaller. Now that the hotel is bigger, the parking plan is well below town requirements. 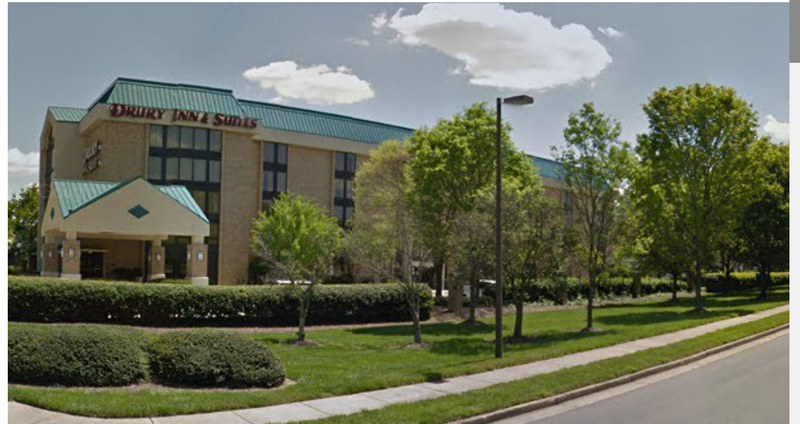 At 85,000 sq feet the hotel should have 170 spaces, not 118. That's 52 spaces short of minimum requirements. According to the staff analysis, the developer says that may be no big deal. "Usage patterns vary depending on the nature of each commercial space. 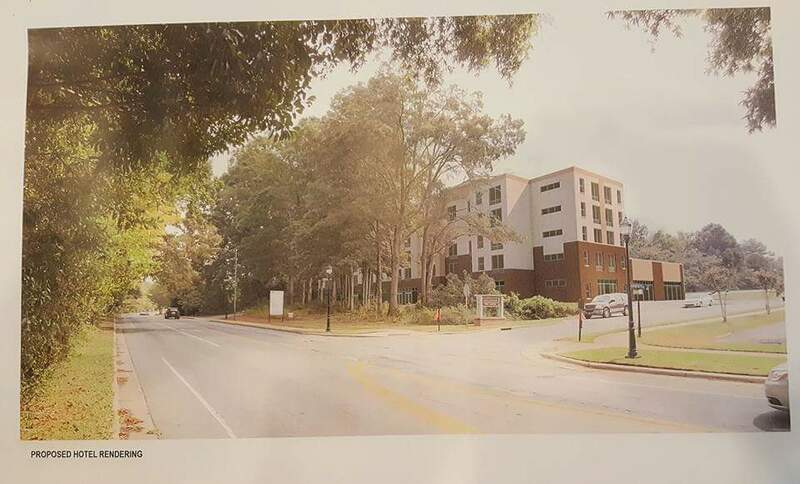 Based on their experience developing and operating the nearby Homewood Suites Hotel, the developer believes that parking area to be over-built after observing actual usage patterns. The developer noted that many visitors do not arrive at that hotel in their own private car but instead utilize taxis, corporate transportation, or ride-sharing services that do not require their use of parking facilities. Their experience in this local context informed the current proposal." The problem with that logic? These two hotels will be fundamentally different in one particular way. The proposed Hyatt Place plans to have a roughly 5000 sq foot rooftop restaurant! According to town staff, the restaurant will be calculated as a separate use beyond the hotel in the TIA. 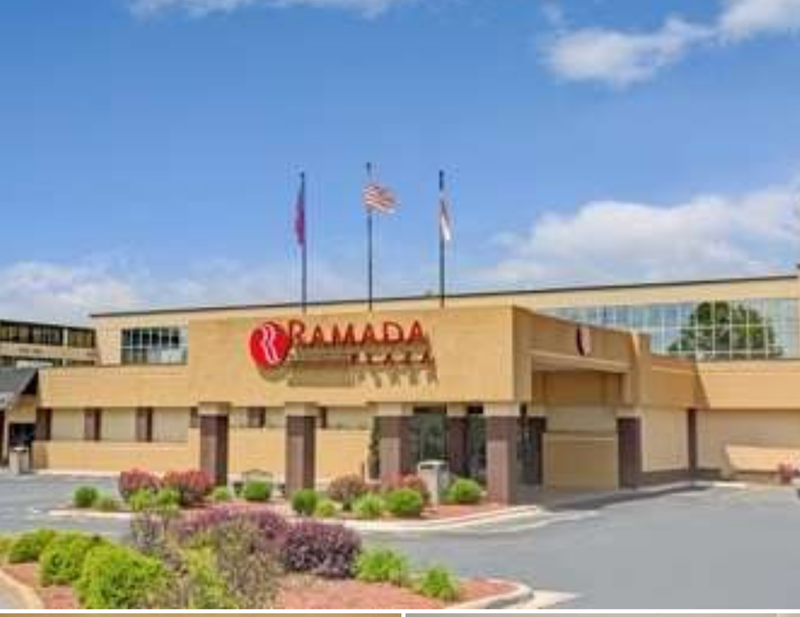 It should also be noted, the hotel will have less than 1200 sq feet of meeting space, and per the town, according to the Institute of Transportation Engineers (ITE) this is considered an "ancillary use" for the hotel. Basically, that means it's small enough to not attract large additional meetings or gatherings such as weddings. Meeting space will not be calculated as a separate use. The inclusion of a restaurant and the volume of cars it will attract is not the only problem with parking. The plan also includes 29 "shared" spots with Woodies Auto next door. 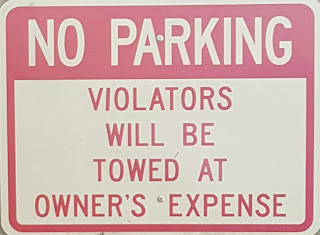 Woodies only has 29 off street parking spots! That's not sharing. That's more like taking. The 29 spots at Woodies includes 3 handicapped spots and 2 spots right at the front door. These can't realistically be included. That leaves 24 spaces. Sharing would imply no more than half of these should be included. 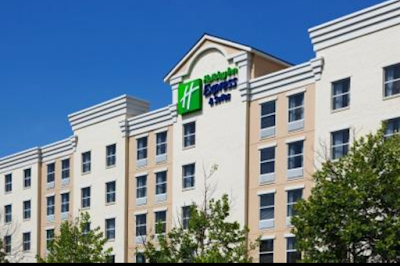 Common decency would say the Hyatt place should be able to claim no more than 12 spaces on the Woodies site, not 29. 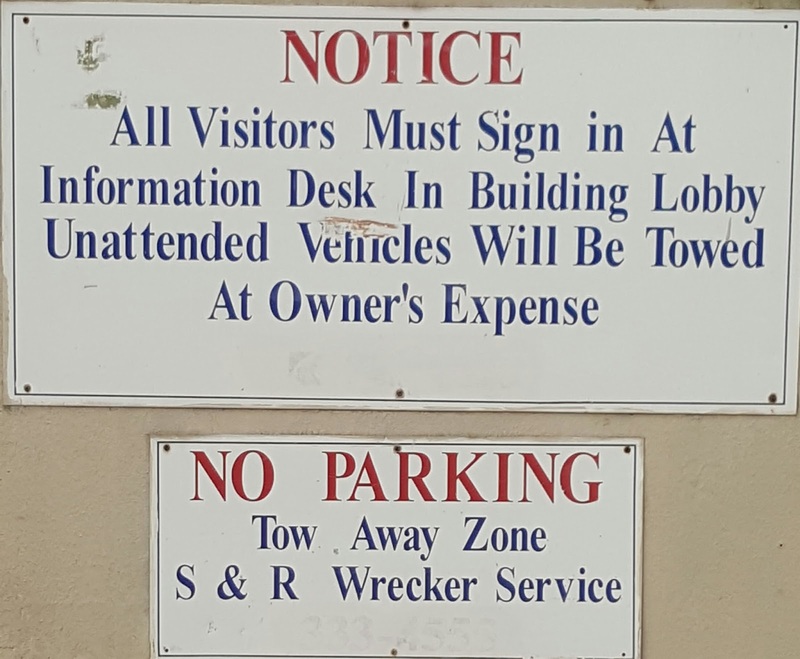 Adding further to the parking problem is the fact that that the site is currently used entirely for parking. 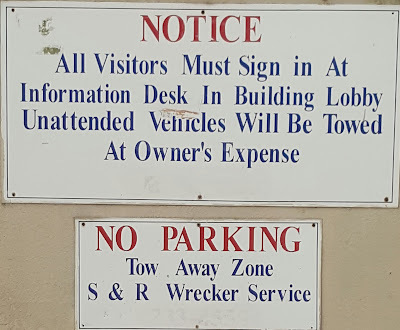 On any given day you can see 20+ vehicles parked there. While that may not be the developer's problem, it is a problem for the town. One can reasonably expect that most or all of the 19 on-street parking spaces to be regularly consumed by the vehicles currently using that lot if a hotel is built. As a practical matter, both of these situations are primarily weekday problems rather than nights or weekends which will alleviate the situation somewhat because those are the peak times for a hotel and not for CSD and Woodies. However during the weekday that would mean the hotel proposal is effectively an additional 17 spaces short for Woodies and probably the full 19 short for its on-street parking - providing only 82 usable spaces, not 118. Any TIA that is completed needs to directly take all of this into account and not just look at the peak use for the hotel and potential restaurant. Regardless, this project is now looking at 3 significant approvals from the town. 1) Change of use for a hotel. 2) An increase in height to allow 6 stories. 3) At least a 30% reduction in parking provided versus what's required by ordinance. That's a lot for Commissioners to approve and still claim to be acting in the best interests of the town. #Catalyst2: Hotel info session didn't have all that much info available. Two weeks ago, the developers behind the proposed Hyatt Place hotel next to CSD on Griffith street held an information session for locals to see what the project was all about. The event was well attended, but it's unclear how much real "information" was conveyed. There was no fact sheet handed out, only a few resolving slides on the projector. Numerous drawings were haphazardly laid out on tables for people to review. Sometimes it was difficult to know what each picture was trying to convey. Some of the slides seemed to be subtly be saying "be careful what you wish for" when it comes to the alternatives if a hotel is not built. Take look at the below pictures. The first picture is an artistic rendering of the proposed 68 foot, 6 story hotel. The second is the currently allowed pair of 3 story mixed use buildings. Notice anything odd about these two pictures? The three story buildings are the same height as the six story building. Both buildings can't possibly be the same height. This is true even when acknowledging that from the angle in these pictures one might not be able to see the 6th story rooftop restaurant because it is set back a bit from the fifth story. There didnt appear to be any pictures from any angle where you could actually see the 6th story. This of course is misleading in multiple ways. It is either not accurately depicting how tall the hotel will look from the road, OR it makes the alternative look worse than what it actually would, OR both. Another omission on the hotel rendering side which was explained at the meeting (if you asked) is that the sidewalk along Griffith Street will be pushed back to make way for on street parking. Additionally, the existing entrance onto the site closest to town will be closed forcing all drivers to use Gateway Drive. Finally, the exterior design of the hotel doesn't seem to offer much. It's reminiscent of the Linden Apartments around the corner which doesn't receive high marks as far as aesthetics goes. Frankly, the proposed hotel design doesn't look any more intriguing than these other lower budget hotel lines. It will be interesting what the town Design Review Board has to say if the project progresses that far. Dave Malushizky with the local office of The Lawrence Group is the architect. There was one interesting bit of info that came out during the meeting. The project is now being required to complete a Traffic Impact Analysis. With traffic and parking being major issues for this site, that will be revealing. More on the TIA in the next post. Stay tuned. Davidson acting as developer on multiple projects? Davidson Mayor John Woods is fond of recounting population numbers whenever there’s a discussion regarding regional growth at Davidson Town Hall. Over the years, regulars at town events have heard multiple times the comparison of Davidson’s population growth to its neighbors. Davidson has long had a reputation for controlling growth, sometimes being accused of being heavy-handed in comparison to other Lake Norman towns. To be fair though, the statistics are pretty startling. According Google, in 1990 local towns had relatively tiny populations. 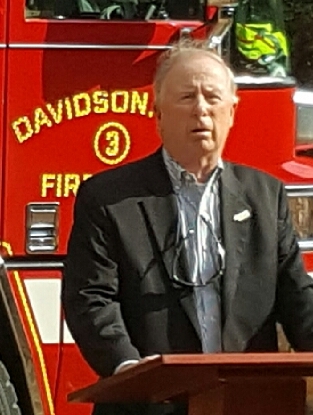 Davidson sported 4182 residents. Cornelius came in at 5067, and Huntersville had just 6653. Mooresville was a relative metropolis at 11,257. Compare those to 2013. Davidson had 11,750 – up 281%. Cornelius was at 26,898 – over 450%. Huntersville was at 50,458 – a mind boggling 758%. Mooresville leapt to 34,887 – a relatively Davidson-tame - 300%. As everywhere, this frantic pace came to a screeching halt with the Great Recession. Over the past two years however the pace has started to pick back up and growth, like it or not (with “not” being the most common sentiment), has ramped back up. What seems very noticeable with this wave of development, particularly in Davidson, is the level of involvement where the local government is playing the role of “developer”. Davidson has no less than five different projects in various stages of planning where the town is driving the discussion. 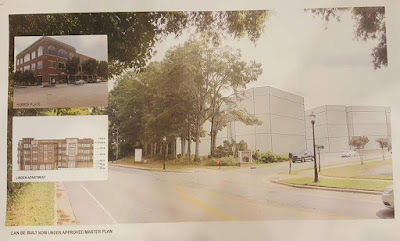 In August, the Town officially pulled the plug on the controversial Catalyst Project that would have potentially brought a massive mixed use commercial/residential/public sector project to the current Town Hall site on Main Street. In its place however, last month Davidson put out a Request for Quote (RFQ) for design firms to propose just public uses for parking, a remodel of the exiting Town Hall, and a new municipal building on Main Street next to the JJWade building. The town planned a second RFQ for Public Works as well, but that was decided against because design work already completed is sufficient to proceed without one. How these projects would be paid for is still unclear but they could result in Davidson pursuing its firs ever general obligation bond requiring voter approval. The town also has two Requests for Proposal (RFPs) out for other projects on other town owned land. 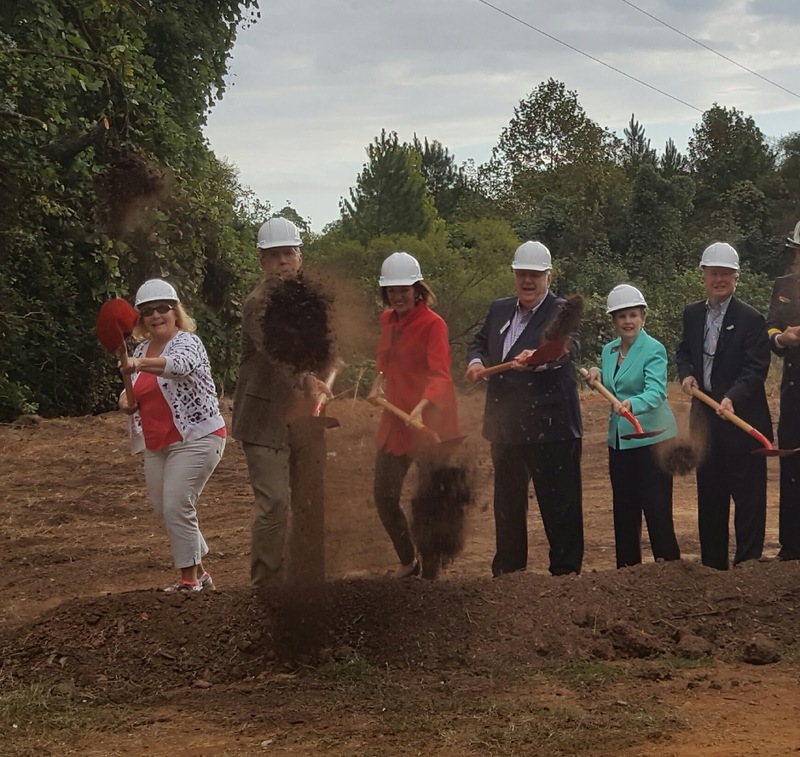 The first is an affordable housing project in the Bailey Springs neighborhood. The town received just two responses from builders interested in the property. In both cases the builders wanted the land for free, and while no official announcement has been made at this time, all indications are that something will move forward here. The other RFP could be a much bigger deal. The town is seeking proposals for a large mixed use development on its 18 acre property along Beaty Street ending at the intersection with NC115 just north of downtown. Responses are due back in early December. The RFP states the Town plans to make a decision by February 2017 on whether or not to move forward. It should be noted however that the a developer approached the Town prior to the RFP going out and that had at least something to do with getting this effort underway. That could be read as at least one acceptable proposal may already be on the table. 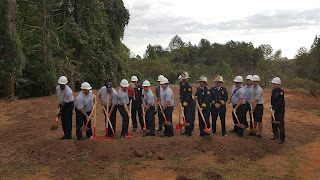 Finally at this past Tuesday’s Board meeting, the town was slated to put the finishing touches on financing before breaking ground on the long awaited Fire Station #2 on Davidson’s East Side. Of all the projects on this list, this is the one, maybe the one that’s most truly needed. This project off Davidson-Concord Road by the Beaver Dam House will close a long term gap in fire service that has been covered via a contract with the Odell fire station in Cabarrus County. Some call it a sweetener. Others call it an incentive. It has also been called a bribe. When necessary, it has been used as a hammer. What is “it”? Why, ‘it” is the I77 HOT Lanes Bonus Allocation funding of course! 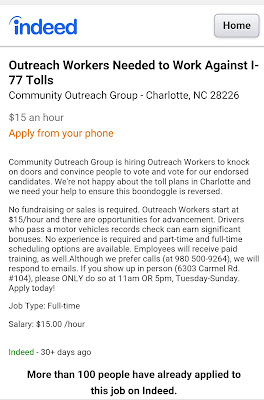 As the I77 HOT Lanes project was being “sold” or “marketed” or “rammed through” the process, one of the biggest selling points by those supporting the tolls both locally and in Raleigh has been the idea that the area would be getting extra money (aka Bonus Allocation) to fund a grab bag of projects long sought after by local Town Halls. Like any promise that sounds too good to be true, this one has turned out to be just that. One would think something intended to induce a positive response would not come with strings attached, but nothing could be further from the truth in this case. 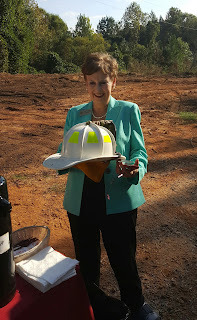 Instead, Bonus dollars could only be spent on certain categories of projects – many of which were priorities of NCDOT. To make matters worse, when the list of Bonus Allocation projects was first approved by CRTPO it included projects that by all rights should have been included in the HOT lanes project itself. Two Bonus projects were actually direct access ramps to funnel more customers onto the HOT Lanes. Those projects alone totaled $77 million and accounted for half of the Bonus allocation money. In fact, if it wasn’t for work that should have been part of the toll project itself being spun off as a “bonus”, it’s easy to see how the controversial project might not have happened at all. When the HOT lanes debt was rated, it received bond ratings one level above “junk bond” status. If $77 million in access ramps had been added to that debt load, it’s easy to see how “junk” status would have been the result. Junk status for the debt very well may have killed the project financially. The State throwing in $77 million more in equity certainly could have killed it politically. The solution? Put the money in the bonus allocation and tell the public it’s what they want. “Bonus” dollars used to support a project the locals don’t want doesn’t sound like much of a bonus now does it? Unfortunately, the tangled web doesn’t stop there. No, those were just the big ticket items involved in the twisted path down the bonus allocation road. Even some small things have required, shall we say, “flexible” thinking to get them done. Take what’s happening in Davidson for example. Davidson is slated for two of these bonus projects. One involves new roundabouts bookending the new Exit 30 bridge built as part of the HOT Lanes project. Arguably, these too should have been part of the HOT Lanes project itself just like the direct access ramps mentioned above. The other project planned to receive funds is one long desired by Davidson Town Hall. It’s called the Potts-Sloan-Beaty Connector. 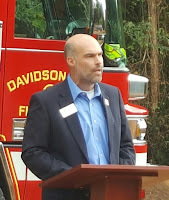 The bonus money is relatively small amount at about $2.2 million to be used as matching funds to connect Potts Street and Sloan street in Davidson’s West Side neighborhood. This will provide a bypass of Main Street for through traffic on NC115. The problem with this second project? As a town owned road it was not eligible for the matching funds. Never fear however. The Town and NCDOT solved that little problem by temporarily transferring control of the street to the State making it eligible. Once the project is done, the State will transfer it back to the Town. 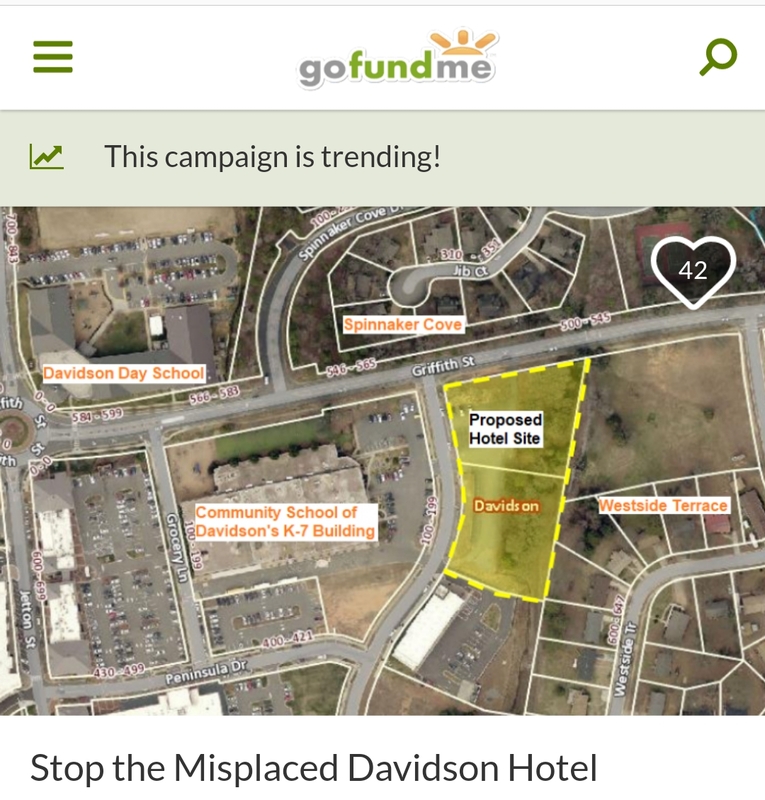 This plan unanimously flew through Davidson’s Town Board back in July. By way of comparison, try moving ownership of some of your real estate holdings with the unwritten promise to transfer it back once funding is secured for a future project and see how that works out for you. That’s effectively what was done here – all to get access to some money that was supposed to be a bonus. Maybe untangling a “riddle” was the wrong metaphor for this column. A game of Three Card Monte might have been better. aShortChronicle previously told readers about the wave of outside money flowing into local races for the NC General Assembly. 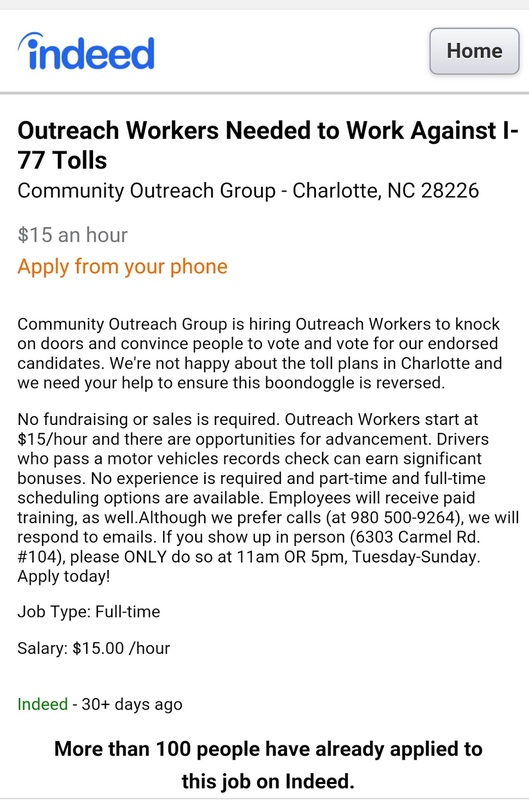 Specifically, we've covered the dark money operation called NC Families First which has been hitting NC 98 Rep John Bradford on the I77 tolls issue. While aShortChronicle HQ appears to have somehow gotten off the mailing list for this outfit (we wonder why?!?! ), our readers tell us the mailers are still coming. They have shifted gears somewhat and moved on to other topics however. Maybe that has something to do with the fact Bradford recently received multiple endorsements from anti-toll advocates exposing the misleading nature of those earlier flyers. Attacking Bradford hasn't been the only mischief NC Families First has been up to though. Republican candidate Danae Caulfield has also been targeted in the neighboring NC92 race. Caulfield, a former Huntersville Commissioner, entered the race late after Rep Charles Jeter resigned suddenly back during the summer. As a candidate, she has also been targeted by NC Families First. 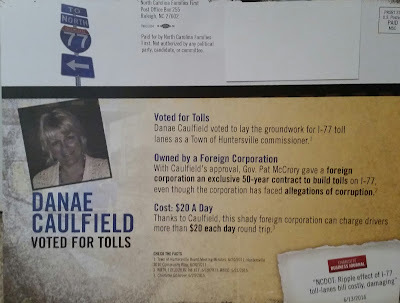 Since Caulfield has not been an elected official since 2011, it's hard to see how she "voted" for I77 tolls. So, where could that attack have originated? 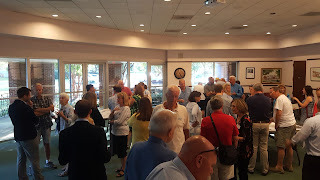 Well, Caulfield did vote for the award winning 2030 Community Plan in Huntersville as a Huntersville Commissioner. That plan did have a section on transportation. 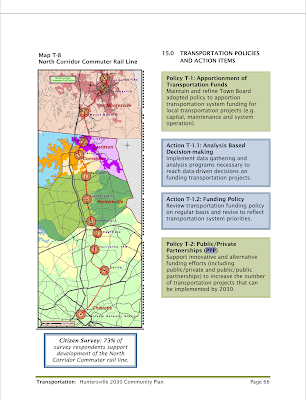 The thing is, that transportation section wasn't about tolls, and it was barely about I77. Instead the biggest project, the one where Public Private Partnership was mentioned as part of the plan, had to do with the Red Line Regional Rail project. See below. 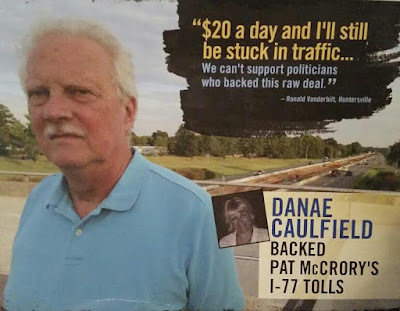 So, Caulfied is being skewered over tolls on I77 by dark money from an outside group because she voted for something that didn't have to do with I77. One of the anti-Caulfield mailers featured a picture of local anti-toll activist Ron Vanderbilt of Huntersville saying "we can't support politicians who backed this raw deal." aShortChronicle caught up with Vanderbilt on Wednesday and learned he was unaware his comments and photo would be used against Caulfield. He thought it would be for a flyer against Governor Pat McCrory. When asked if he would have condoned using his comment and photo against Caulfield, he said "no". 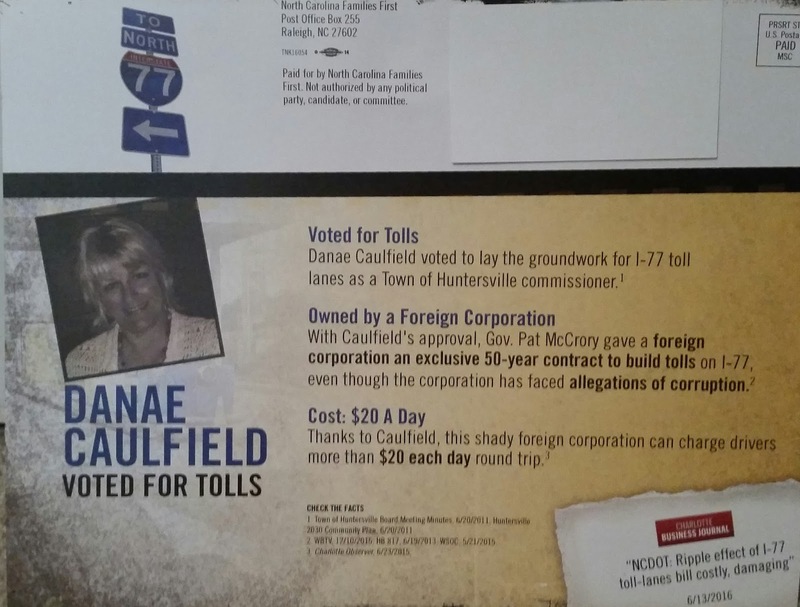 these flyers, the I77 Business Plan endorsed both Caulfield and her Democrat opponent Chaz Beasley in the race for NC92. The I77 Business Plan recently endorsed a bi-partisan list of candidates in the upcoming elections, but this race was the only head-to-head race where both candidates were endorsed. These flyers from NC Families First are prime examples of what turns people off to politics. As such, Democrat Chaz Beasley should disavow these misleading efforts clearly intended to benefit his campaign. Not doing so does a disservice to voters and tarnishes the endorsement from the I77 Business Plan. However, this is politics, so holding one's breath on that one is not recommended. #Davidson Reverse Angle Parking...When are the training sessions? aShortChronicle told readers a couple weeks ago about a new parking scheme coming to Davidson called "reverse angle parking". It's an approach intended to make things safer for pedestrians by having people back into spaces instead of pulling in head first like normal. The town put out this release on the approach on Tuesday. Below are a few examples of how there might need to be some public training on the subject. These are the new reverse angle spots on Jetton by the new Linden Apartments. As you can see, it doesn't matter what time of day, only about half of drivers get it right. Other readers in the Circles@30 area indicate the spots are too narrow and that the street itself is too narrow for lots of reverse driving parkers. Also, the spots are right after the roundabout at Griffith street, so you will have people coming off that roundabout being met by people backing up into these spots. Finally, many and possibly most people leaving these spots will be wanting to go back towards Griffith and I77, so they will be forced to make a more than 90 degree turn out of them or go through the Harris Teeter parking lot. Whether this new scheme at this location makes things safer or more dangerous remains to be seen. 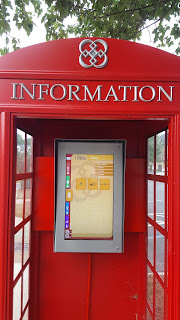 #Davidson Info Kiosk Info...What are the numbers? 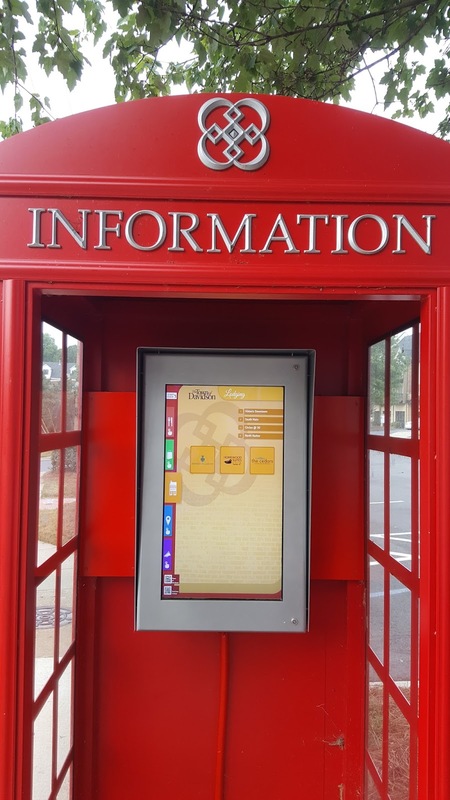 In June, the Public Information Kiosks (aka the Red Phone Booths) on Main Street in Davidson finally came to life. Reader reaction to them on Facebook varried from mild amusement to serious outrage at the cost. aShortChronicle reported that the cost was about $25,000, but a reader quickly indicated that Town Hall had told him the total cost was actually $42,000. On further investigation the $25,000 figure was to "complete" the kiosks in FY2016. There was also a budget allocation in FY2014 for $26,000 for 3 kiosks, so the higher figure is likely correct since only 2 were installed. Regardless, it's a LOT of money for what it provides. One would think Town Hall would want some detailed reporting out of these high tech devices to make sure it was at least providing the most value possible. After three months in operation, aShortChronicle checked in with economic development manager, Kim Fleming, to see how things were going by asking for the detailed metrics. "From June 13 until Oct. 3, there were 1,235 individual sessions between the 2 kiosks." That comes out to about 11 sessions per day. When asked for more detail Fleming responded with "what I sent you is what is available." Really? Just one raw number over the life of the system? That's it? No breakdown of which pages are most viewed? What days of the week get the most views? Nothing about whether or not there were major spikes in sessions when the kiosks first launched or when Davidson College students returned to town? How many average daily views were there if those outliers were excluded? Also, no explanation of why the count started at June 13 when the kiosks weren't announced to the public by the town until June 23rd. Does the total number of sessions include testing prior to launch? Just a raw number that comes out to 11 "sessions" per day. That's all That seems odd. Always in search of "the rest of the story" as Andy Rooney used to say, aShortChronicle contacted Nvisionative in Mooresville. That's the firm that actually performed the programming for the kiosks. According to the tech there, the kiosks use Google Analytics which would provide much more detail than just a total raw number - detail that would answer most of the questions asked here. Maybe the Town just doesn't know how to use the software. Maybe the tech at Nvisionative doesn't know what their own software actually does. Or maybe, when you've spent that much of other people's money on something like Red Phone Booths, it's best to just not ask (or answer) too many questions. The big DC political money just keeps pouring into the NC House races here locally. 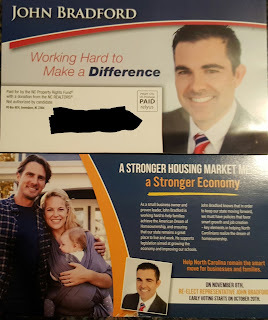 aShortChronicle told you previously about the mailers from NC Families First, a DC funded dark money operation out of Raleigh. 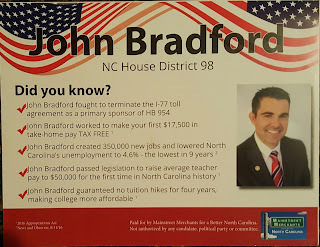 The group had been sending out mailers targeting NC98 Rep John Bradford - hitting hard on the I77 issue. The group focuses on a vote Bradford took way back when he was a Cornelius Town Commissioner supporting the RFP process for the HOT Lanes project. This of course ignores the fact that since then, once the RFP concluded and the contract details were known, Bradford has become a strong opponent of the project. He signed the letter to Gov McCrory from a majority of North Mecklenburg Commissioners asking for a contract delay. He was also a primary sponsor of HB954 seeking cancellation of the project once it was signed. His reward for doing the right thing? Dubious attacks from an outside group. However, those that know the truth about Bradford's overall efforts in the anti-toll fight appear ready to make that truth known. Nobody knows the history of that fight better than Kurt Naas. aShortChronicle has learned Monday morning from Naas that he has personally endorsed John Bradford in this race. This endorsement should go a long way in righting the wrongs of the flyers sent in support of Bradford's opponent, Jane Campbell. Naas has been the "face" of the anti-toll fight since the very beginning. He is the founder of WidenI77.org, the group that initiated the pushback against this ill-conceived plan. He has spent countless hours over many years researching and presenting the facts of how this project will harm the Lake Norman area. Naas's opinion matters when it comes to tolls, and this endorsement more than any number of flyers to the contrary should matter to voters.